Finance Department, Punjab Government has issued a Notification regarding Deduction of Salary Finance Department Punjab from Basic Payroll 2018 on 14-09-2018. It is directed to mention to this Division's letter of even number dated 20 Aug 2018 (as per copy enclosed) and Government has decided to deduct one month salary of the Members of Cabinet Punjab Government, two days salary of the officers (BPS-16 & above) and one day's salary of the officials (BPS01-BPS15) of all Administrative Departments/ Attached Departments /Field Formations and Autonomous Bodies or Companies. 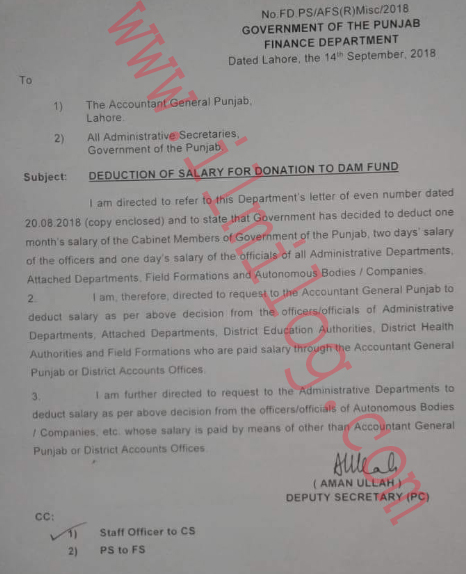 It is directed to appeal to the Accountant General of Punjab to deduction of salary as per above verdict from the officers and officials Administrative Departments/ Attached Departments/ District Education Authority/ District Health Authorities and Field Formations paid salary through the Accountant General Punjab / District Accounts Offices. It is more directed to demand the Administrative Department to deduction of salary as per above assessment from the officer and officials of Autonomous Bodies, Companies whose salary is paid by revenues of other than Accountant General Punjab / District Accounts Officer.